BBC’s Springwatch filmed Dolphins feeding at Chanonry Point, on the north shore of the Moray Firth, about an hour from Findhorn via Inverness. ‘Chanonry Point is a spit of land protruding into a narrow, deep channel, with a steeply shelving beach where dolphins come in to the shallows to feed on the salmon and sea trout brought in by converging currents. Around 100 Dolphins live here in the cold waters of the most northerly colony on Earth, one of only two colonies in the UK.‘ – BBC Natures Calendar (link). 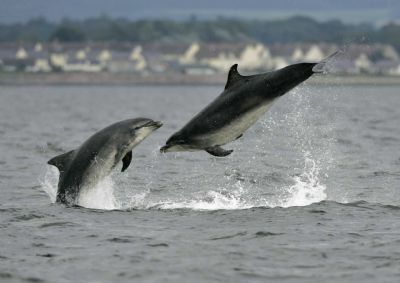 If you wish to plan a trip to view local wildlife, including the Dolphins, contact Wild at Heart’s Deborah Benham, who lives in Findhorn (link). For information on other ways or places to view dolphins, take a look at the Dolphin Space Programme website (link). For something a little closer to home, contact NatureWalk Findhorn (link). Or plan your own birdwatching by using the RSPB website. RSPB Culbin Sands is a short distance away (link). You are just as likely to see a large number of waders and even an Osprey, sitting in front of the Kimberly Pub with a binoculars in one hand, and a beer in the other! Either way, you will find an abundance of wildlife year round in and around Findhorn. Off season we are happy to entertain short break or weekend bookings for you at Myrtle Cottage Findhorn. Giving my website a spring clean & will be adding you in as No.1 link on Accommodation. Really like your website! Looking through, I noticed this query about lizards. These will be Common Lizards, which are found throughout the UK in heathy/sandy/scrubby areas. They like to bask in the sun during the day and hunt small insects. They hide on cold days and at night and hibernate through winter. Our only other lizards are Sand Lizard (a southern species and much rarer) and the legless Slow Worm. I will try to reply directly to Joe.